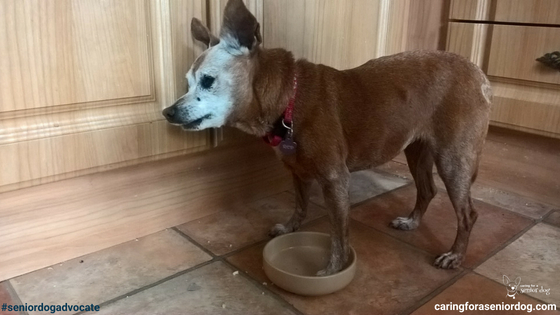 Have you discovered what the best dog food for senior dogs is? If you haven’t I assume you’re hoping I will reveal the brand…right? Well, I don’t believe there is a “best” senior dog food for every dog. The “one size fits all” approach many take simply does not make sense to me. Some brands are far superior to others, and dogs have individual needs, some requiring a more specialised diet than others. Various “experts” claim XYZ brand is the best ever invented, while others insist it is ABC. Who’s right? If your dog has not been for a check up in awhile, now would be the perfect time to schedule one. 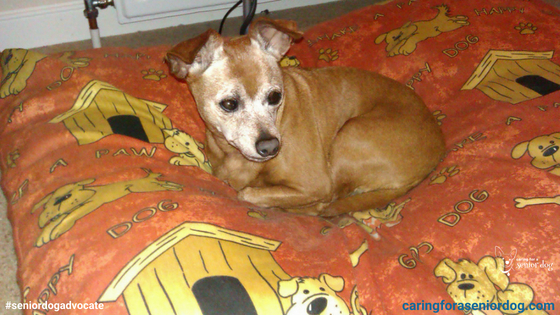 A senior dog check is usually pretty thorough and includes urine and blood tests. I recommend this as a first step for a couple of reasons. It’s always easier to tackle a problem when it’s still a minor one, rather than when it’s reached its full blown stage. Should your dog have any health issues that may impact the type of diet you choose, it’s best to know before you switch. Have a conversation with your vet about the results, and whether they have an impact on the type of foods your dog could/should be eating or avoiding. Here is where things can get a bit tricky, and let me explain what I mean. Not every vet knows as much about pet nutrition as you would expect them to. Your vet may have “nutrition experts” on staff, but if you look at some of the plaques on the wall you will notice most, if not all of the courses, were given by a major pet food company. You will also notice they are usually the brands stocked. Also, your “conventional” vet will have different views from one that practices holistic medicine. Here is a perfect example from my life…and Red’s! We adopted Red 8 years ago when she was around 8. The poor thing was blind and morbidly obese, her stomach literally touched the ground. After a visit to the vet she was put on a well known brand weight loss diet, then a maintenance formula. When she no longer needed that kind of help, I bought senior dog food from a pet supply chain. I assumed senior dog, senior dog food and that was that. Although I was not aware of the need to read ingredients or to even understand what they meant, I did at least know there was a difference in quality. I never bought cheap food, or the big brands sold in supermarkets. Of course paying more doesn’t necessarily mean getting more in terms of quality, or wholesome ingredients. When Red started having issues with her heart, my vet recommended a prescription heart food. When she started having issues with her kidneys he recommended switching her over to a prescription kidney diet. To be honest I did as he suggested because he’s an amazing vet, and I trust him with Red’s life. I never bothered reading the ingredients, and carried on my merry way. While writing about senior dog nutrition I came across an article about prescription diets, and I must admit I was surprised, okay shocked, by what I read. There were comments from a few holistic vets who felt they lacked nutritional value, or any value, and recommended avoiding them. They then listed the ingredients and highlighted what was wrong with them. Don’t think I didn’t jump off my couch and run to read the ingredients, and yes I was taken aback by the lack of any “real” food in the can. The thing is, Red has a number of health issues and we walk a very fine line to keep her balanced, so I was not about to make any changes to her diet. And besides, my vet has been happy with her “progress” so no rocking the boat…certainly not without guidance. About a year and a half ago we spent a few months in Spain and of course I needed a vet. Since I had wanted to take Red to a holistic vet for quite some time I searched for one in the area. Well, a 50 minute drive wasn’t exactly “in the area” but it was worth the chance to finally see one. I make it sound like I was given the opportunity to see an endangered species!! Don’t worry this is relevant!! Since Pepe (my Spanish vet) did not know Red, he did a series of blood tests to get a comprehensive picture of her current health. The first thing he did when he got the results was create a home cooked whole foods recipe for her. One of the main principles in holistic veterinary medicine is health through a wholesome diet (the same for humans), and he was definitely not happy with her prescription plan. Well, she loved her new food and hadn’t been this enthusiastic about meals in a long time. Sadly Red died 2 months ago. Okay now I have totally confused you! Sorry it probably seems like things are as clear as mud, but rest assured I will give you the advice you seek! I merely added my experience so you can see where we started, and how we arrived at this point. Lots of people buy their senior dog’s food off the supermarket shelf, and they’ll tell you their dogs are fine, and you can do the same. If you trust that pet food manufacturers would only produce quality products that contain everything you need to meet your dog’s nutritional requirements, you’re good to go. If you’re loving your vet, you have the utmost confidence in his skills, and you entrust the health and well being of your beloved dog to him, then follow his advice. You are perfectly entitled to ask why he recommends that particular brand, what ingredients he is impressed by and why this one over others. If you “believe” in holistic medicine or you’ve never heard of it, either way you may want to make an appointment to speak with a holistic vet. You could find their perspective on nutrition very enlightening. You are under no obligation to follow their recommendations, just do it as part of your research. A bonus…they don’t all charge for that initial consultation. There is so much information about pet nutrition out there it can be very confusing, especially when much of it is conflicting. It’s important to be aware of the source of that information, who wrote the article and what their expertise is. Learn how to read a label, what the ingredients actually mean, and how to interpret claims made on the packaging. I will give you an example- more and more pet parents are looking for grain free foods because they find it helps stop their dog from scratching, or they’re buying supplements for their joints, skin and coat. You’ll find most pet food companies have jumped on that bandwagon and offer grain free formulations, as well as foods with added supplements. When a supplement is added, let’s say fish oil for example, it is impossible to tell how much has been added or the quality of the product. Also, most has been destroyed in the manufacturing process so your dog will benefit a lot more from you adding it directly to his diet. What can you do in the meantime you ask? Whether you’re sticking with the food he’s on and leaving it at that, or are interested in exploring options, there are things you can easily add to improve the quality of his current diet. What ever you decide to do, I always advise speaking with your vet before making any changes. You’re still waiting to hear about a specific brand aren’t you? Some senior dogs can eat anything and have no problems, others have health challenges that may affect the types of foods they are able to eat. It’s best to find out your dog’s current health status, get recommendations from your traditional and holistic vets, do your research and decide what makes sense to you. If Red had been able to eat any type of dog food I would have fed her Lily’s Kitchen with some raw food added, for a number of reasons. I also wanted limited ingredients, not a list as long as the height of the can!! Let me start by saying, I am not recommending you start feeding your dog this brand, this is just what I feed mine. It’s also only available in the UK except through Amazon but it’s very expensive. I started my search for Jack’s new food in a pet supply store, reading the ingredients on every single bag and can of dog food. I do mean that literally. I read those from pet food companies I knew had poor quality ingredients, to the brands I had heard were excellent. I was sure I would end up with one of the brands considered “excellent” but I read the poor quality brands anyway, just out of curiousity. Imagine my surprise to find how low down the list anything resembling a real food was on the great brands!! I felt things were not looking good. How could I buy a dog food I wasn’t happy with, knowing what I know? Finally I got to the section with Lily’s and I knew I found it!! Protein, fruits and vegetables were at the top of the list, and nothing bad on the bottom!! They had a nice selection of flavours, handy because Jack is picky, and it comes in a dry dog food as well, which I like to mix in with the wet. Here is some information from their website about why I like this brand. As I already mentioned, we went to Spain for a few months so of course I had to bring a supply of Jack’s food. I knew I wouldn’t have enough, especially since we had no idea how long we would be away, and I was not looking forward to another search. Imagine my surprise the first time I went to see Pepe, and lining his shelves were cans of…you guessed it Lily’s!! I couldn’t believe it. It’s not a massive company you find all over the world like some brands. I was happy with my choice anyway, as was Jack, but the fact my holistic vet stocked it and gave his seal of approval made it even better. I hope you have found the information here helpful, as you make your choice of the best senior dog food for your beloved pup. 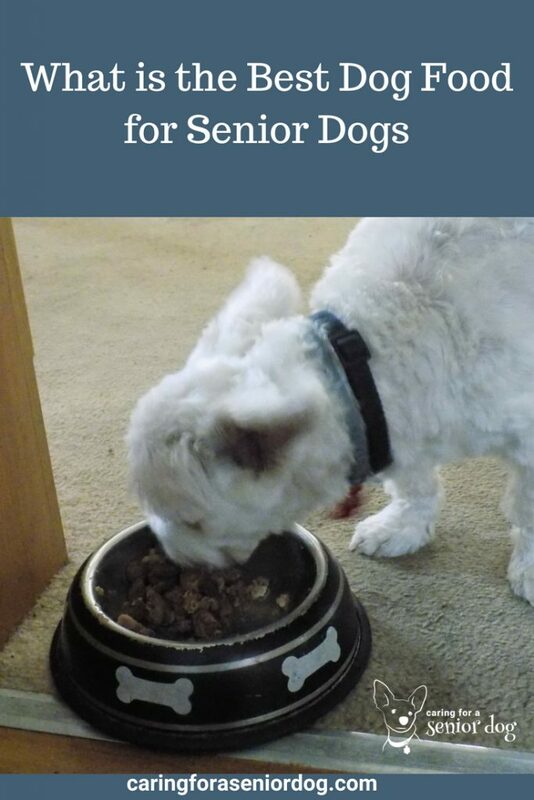 What do you feed your senior dog? Are you still using an adult formula, or have you switched to a senior, or perhaps a condition specific food? Have you noticed any differences in your dog since switching? I’d love to hear what’s working for you, what hasn’t and what led you to choose the brand your dog is eating. Let me know in the comments section below or post on my Facebook page. Great advice! Dog owners are often unaware of how a dog’s nutritional requirements change as it goes through life. For example, an older dog needs to be consuming less protein, and this protein needs to be more easily digestible than what a younger dog would require. In an older dog, too much protein risks overburdening the kidneys and damaging their filters, which could lead to renal failure. Definitely not an outcome anyone wishes for, and one that could be avoided in most cases. Education, through regular consultation with your vet and sites like this one, is important for every dog owner. Hi Kae, thanks for taking the time to offer feedback. You certainly know quite a bit about nutrition. I find the whole subject a bit of a minefield don’t you? So much conflicting information and advice. For every 5 people that love a product, 5 people don’t. I’m planning on a lot more articles about nutrition as my site develops, hopefully clarify some things. I definitely agree on regular consults with the vet. Thanks for the advice, I think the best way to treat your dog if is feeding him the food of high quality, but the concern is: How do you know which is the proper food, that food quality and where is the place where you can purchased but not the one recommended by the vet? Hi Renan, Appreciate your comment. Trying to figure out what’s good food, and what isn’t is very tricky. Typically you want to see a meat product listed at the beginning of the ingredients – chicken, turkey… and the fewer ingredients the better. I will be exploring the issue of food in future posts. In the meantime what I can offer you is some advice. In terms of the proper food, you have to take a look at your dog’s age, health, are there any issues that would benefit from condition specific foods, are there ingredients that could be harmful to him, any that he requires. If your vet does not carry the brand of food you’re interested in, a quick internet search will let you know who carries it in your area, or simply order it online. Hope this helps, and thanks again for your feedback. Thanks for this info! I have an old dog that was given to me a few weeks ago. Her owners travel a lot and couldn’t properly take care of her, so they asked if we would keep her. She’s a sweetheart, and I want the best for her, so thank you for this! Hi Rod, Very nice of you to take on someone else’s responsibility. New content is added about twice a week so check back often. If you need any help or advice, please let me know. Although I don’t keep any dogs, I do love them and enjoy playing with them. I’m glad you are not recommending any particular brand of dog food as every dogs’ needs is different and unique. I’m curious. Is the everyday food that humans consume suitable for canines? Food like bread, rice, biscuits, etc. Hi Yvonne, thank you for your comment. I know many people do recommend or promote specific dog foods, but I won’t. I believe there are too many variables for me to make assumptions about nutrition. It’s best to feed your dog a diet designed for dogs, but there are definitely human ingredients that could be added – rice, sweet potatoes, squash, carrots, bananas, apples to name just a few, but I always recommend you speak to your vet about any changes to their diet. My Labrador just turned out 13 and we are all worried about his health. I am glad I came across your website since it provides valuable information about older dogs. I was relieved to read that more and more dog food brands are available, addressing condition specific issues. Thank you for the information! Hello Juan, So glad you find the information helpful. I assume you’ve taken him to the vet recently? Even if you don’t see any obvious signs of a problem, it’s always a good idea to take senior dogs to the vet twice a year, more often if there are ongoing health issues that need to be monitored. Hope your dog keeps well. My dogs are 9 years old, so I guess that’s almost senior age in dogs! At this point, I’m still feeding them the same dry food they’ve always had. One thing I do is make sure not to give them too much human food. If I do, I make sure to give them just a little bit (like plain chicken) and mix it into their food at supper time. So far, so good! Hi Elsa, yep definitely senior and sounds like they’re doing well. I’m sure they appreciate some chicken in their bowl. I’ve never met a dog, or cat, that didn’t love some chicken. I recently changed my dog over to a home cooked whole food diet, on the recommendation of her holistic vet. It’s made up of plain chicken, brown rice, quinoa, cooked broccoli, raw carrot, raw apple and olive oil in specific measures. She’s loving it!! Great advice. This would apply to cats as well. Y’know, everyone has an opinion about what is the “best” food. People need to do their own research and talk with their vets about what is best for their pets. Though I have to admit, many vets are not well versed in pet nutrition, unfortunately. Very good article Hindy, the only thing I would add is to make sure the vet you choose is trained in nutrition for seniors(or dogs in general). I know that this isn’t a part of normal vet school, but it seems like holistic vets may make this a priority in their schooling? An excellent point Paul, I should add that. The truth is if I found an excellent vet who didn’t know much about nutrition (as has been the case always…) I wouldn’t let it be a deal breaker as long as they were willing to help me out with questions about “forbidden” ingredients. It’s too hard for me to find a vet I trust for Red, I couldn’t afford to let that stand in my way. Definitely if you live in a place with lots of options, a vet who knows something about nutrition would be a bonus. I love your approach. I’ve always felt the same way for pets of any age, that there is no “one size fits all” food that will be perfect for every dog. I keep telling myself that my older dog, who will be 9 later this year, isn’t a senior yet. He’ll always be my puppy! But I have had to start catering his diet to his age related issues, most notably that I’ve had to start adding supplements that help with his arthritis. I personally feed my boys home prepared diets. My older dog has some serious food allergies and I like knowing exactly what I’m giving them. It helps that we have an awesome holistic vet who is always happy to go over their diets with me. Thanks Michelle. Senior is just a number on the calendar, just like it is for humans. It definitely makes more sense to address each animals needs on an individual basis. I agree with you about homemade diets You’re in control of what goes in, and you determine the quality of each ingredient, especially if allergies and sensitivities are involved. You are fortunate to have a great holistic vet to help, I love that they find natural solutions to issues some traditional vets don’t have tools in their arsenal to tackle. 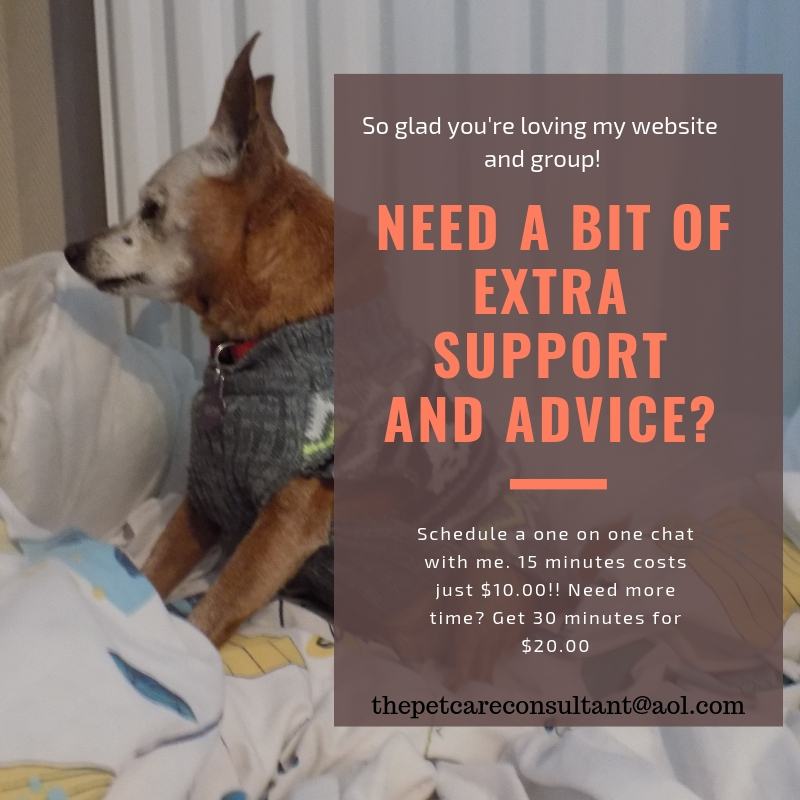 Arthritis is such a major issue when it comes to aging dogs, if you’d like to join my FB group Senior Dog Care Club, others may benefit from your experience, and it’s a great place to get advice as well. Hope you don’t mind me mentioning it, I’m trying to do my best to be a resource for anyone sharing their life with a senior dog. Is Lily’s a European brand? I haven’t heard of it before. Mr. N eats raw and he’s pretty happy with that. None of our vets (holistic or traditional) have suggested a nutrition change. It was created in England. I did see it on Amazon in the States but it’s quite expensive. Glad Mr N is doing so well on raw, I’ve heard a lot of success stories. I’m lucky that I have a few more years before I have to think about senior food. There is so much to consider when trying to pick the appropriate one for your pet, and I enjoyed reading your experience with Red. Enjoy every day!! I agree, there is a lot to consider, and with the conflicting advice from “experts” it can be challenging knowing which diet is the best. At least you have lots of time to figure it out!! Glad you enjoy reading about life with Red. I love the food we feed our dogs and I love the companies (there are 3 that I trust for my two dogs). I won’t mention any brands but my dogs do well on them. I sometimes cook them a simple soup of chicken and veggies to add to their dry food. I call it my “puppy soup”, and they love it! I’ve never heard of Lily’s but thank you for sharing. Good information here! Hi Cathy, great you found something the dogs love, and I love your idea to add the puppy soup to their dry food. Gives them some variety and keeps meal time interesting. I sometimes add some raw carrots, raw apple, cooked broccoli or even chicken to Jack’s food, even though the quality is amazing he gets bored and I won’t switch brands. Lily’s is made here in England, but I did see it on Amazon although it’s very expensive. I mostly home cook for my dog but use dog foods that I would and can eat. It is a good idea to look at your dog’s needs and blood levels as they age. This is very helpful and will benefit pet parents for sure! I agree with you Carol, I like the idea of home cooking so you get to choose the quality ingredients that go into your dog’s bowl. I also like your criteria for choosing food that you can eat as well. The brand I feed Jack would fall under that category. I know trying to figure out pet food is a minefield and I don’t like to see people buy the cheap stuff, so even if they just add a fresh vegetable for their dogs it will make a difference. This must be one of the most valuable posts for senior dog health. it is important and I need to see if I can find an holistic vet near us in New Zealand. I am never happy with food BUT NZ is limited what comes in, although we have excellent raw providers. I would LOVE a healthy diet particularly for our seniors. Thank you Marjorie. Until you find something you’re happy “tart” up what you’re already feeding them, which I imagine you do. Add supplements, a protein, some fresh vegetables and that will up the nutrient value. Are you considering going raw? Excellent post, I feed Layla boiled chicken or turkey and add to it the Macanna Pre-mix by Grandma Lucy’s which has all the superfoods plus in it, the change in her since eating this is just amazing and she is going on 11. The vet went WOW. It’s so amazing what a change in diet can do. When you look at the wholesome foods Layla is eating, then you see what people are putting in their shopping carts in the supermarket it drives you nuts doesn’t it? Maybe it’s just me who is being nosy because I find it sad they’re feeding their pets food devoid of any nutrients. Layla is a lucky pup! Thanks for your comment Sandra and Dolly!! There is so much controversy about what to feed your diets, with “experts” presenting conflicting information you don’t even know how to believe. Here’s something very interesting related to what you mentioned about home cooked food. 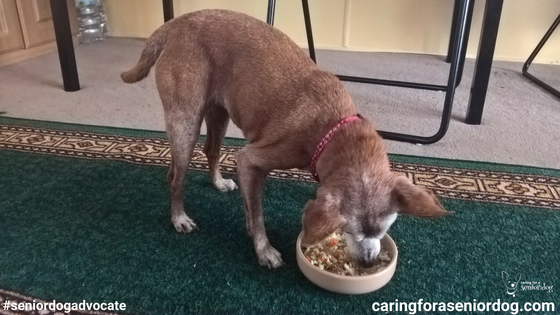 A few months ago I was finally able to take Red to a holistic vet, and the first thing he did was take her off her kidney diet (after he did blood tests to determine her health status), and created a home cooked meal plan specifically for her needs. I was happy because there wasn’t a food ingredient anywhere on the label of that prescription diet, and the thought of giving her whole food thrilled me. She loved it, and she was doing well. Fast forward 8 months and her urea levels were high. My regular vet was not happy that I switched, but I was in another country and didn’t have access to him. Longs story short she’s back on prescription diet, and within 2 weeks her levels were back to normal. Since that was the only change that was made, it’s obvious the food was the problem. What I find funny is my holistic vet believes it was a coincidence (which I do not!!). Did anyone say confusion?? I have to say I don’t believe in “senior dog food” as such. At least not in terms what’s on the market. Unless dealing with a specific medical condition, senior dogs don’t need less protein, most of them need more. I prefer feeding normal diet supplemented as needed based on individual health status. Yep, that’s exactly what I’m saying Jana. Feeding a senior formula just because the date on the calendar changed doesn’t make sense to me. I definitely believe feed according to the needs of the animal, and that includes any supplements that will be beneficial. Feeding our pets used to be easy. Now I realize easy wasn’t always the best. I try to feed the girls a high quality cat food with protein as the main ingredient. I’m happy you’ve found a food that works for Red. It definitely was easier…before we started asking questions and getting wiser!! I read this article long after it had been posted 🙁 All our dogs are seniors around 10. Don’t know their specific ages because they were all rescues. Our oldest girl is 14 and was an owner surrender to our local shelter because she was too old to keep. We took her into our home as a fospice dog because they didn’t think she had much longer on this earth. That was in August 2018 and we are blessed to still have her brighten our lives. Her liver enzymes were so far out of wack that the initial vet didn’t think she would live much longer. WRONG !! Now I”m always searching for things to give her a better quality of life. I really want to feed her food that will help with the enzyme problem. Any suggestion? We really appreciate your posts.